The IBM PC desktop personal computer was introduced in the mid 1980s. International Business Machines Corporation (known as IBM or "Big Blue;" NYSE: IBM) is a multinational computer technology and consulting corporation headquartered in Armonk, New York, U.S. The company is one of the few information technology companies with a continuous history dating back to the nineteenth century. IBM manufactures and sells computer hardware and software, and offers infrastructure services, hosting services, and consulting services in areas ranging from mainframe computers to nanotechnology. IBM has been known through most of its recent history as the world's largest computer company; with over 350,000 employees worldwide, it is the largest information technology employer in the world. It is also the most profitable, but in revenues it fell to second place behind Hewlett Packard in 2007. IBM holds more patents than any other U.S. based technology company. It has engineers and consultants in over 170 countries and IBM Research has eight laboratories worldwide. IBM employees have earned three Nobel Prizes, four Turing Awards, five National Medals of Technology, and five National Medals of Science. As a chipmaker, IBM is among the Worldwide Top 20 Semiconductor Sales Leaders. 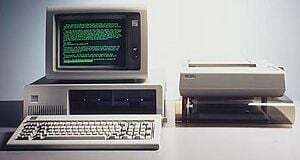 IBM created the IBM personal computer in 1981, which launched a revolution in personal computers being adopted by businesses as well as homes, and whose standard came to be adopted by other major manufacturers like Dell and Hewlett-Packard. Tabulating Machine Corporation plant in 1893. The company originally sold some machines to a railway company but quickly focused on the easy profits of the 1900 U.S. Census. The census sustained the company for another three years, but as the census wound down it returned to targeting private businesses, including automatic punching, tabulating and sorting machines in 1908. By 1911 Hollerith was 51,and his health was failing, so the business was sold to Charles Flint for $2.3 million (of which Hollerith got $1.2 million) to form the Computing Tabulating Recording (CTR) Corporation. CTR was formed through a merger of three different companies: the Tabulating Machine Company, the International Time Recording Company (founded 1900 in Endicott), and the Computing Scale Corporation (founded 1901 in Dayton, Ohio, U.S.). Flint was the financier and key person behind the merger and remained a member of the board of CTR until his retirement in 1930. Thomas J. Watson, Sr. became General Manager of CTR in 1914 and President in 1915. On February 14 1924, CTR changed its name to International Business Machines Corporation, or IBM. At the helm during this period, Watson played a central role in establishing what would become the IBM organization and culture. During the next 25 years, IBM's organization and product lines grew steadily. Despite the Great Depression of the 1930s, IBM continued to develop and manufacture new products, and after the Social Security Act of 1935 secured a major government contract to maintain employment data for 26 million people. IBM's archive website describes this as "the biggest accounting operation of all time," and it opened the door for a variety of other government contracts. The rise of Nazi Germany and the onset of World War II had a profound impact on IBM. Like many U.S. businesses, IBM had relationships and contracts with the German military/industrial technocracy. When World War II began, all IBM facilities were placed at the disposal of the U.S. government. IBM's product line expanded to include bombsights, rifles and engine parts—in all, more than three dozen major ordnance items. Thomas Watson, Sr., set a nominal one percent profit on those products and used the money to establish a fund for widows and orphans of IBM war casualties. In particular, IBM manufactured the Browning Automatic Rifle and the M1 Carbine. Allied military forces widely utilized IBM's tabulating equipment for military accounting, logistics, and other war-related purposes. There was extensive use of IBM punch-card machines for calculations made at Los Alamos during the Manhattan Project for developing the first atomic bombs. 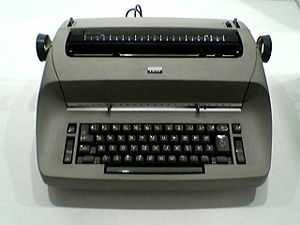 During the war, IBM also built the Harvard Mark I for the U.S. Navy, the first large-scale automatic digital computer in the U.S. In the 1950s, IBM became a chief contractor for developing computers for the United States Air Force's automated defense systems. Working on the SAGE interceptor control system, IBM gained access to crucial research being done at Massachusetts Institute of Technology, working on the first real-time, digital computer (which included many other advancements such as an integrated video display, magnetic core memory, light guns, the first effective algebraic computer language, analog-to-digital and digital-to-analog conversion techniques, digital data transmission over telephone lines, duplexing, multiprocessing, and networks). IBM built 56 SAGE computers at the price of US$30 million each, and at the peak of the project devoted more than 7,000 employees (20 percent of its then workforce) to the project. More valuable to the company in the long run than the profits, however, was the access to cutting-edge research into digital computers being done under military auspices. IBM neglected, however, to gain an even more dominant role in the nascent industry by allowing the RAND Corporation to take over the job of programming the new computers, because, according to one project participant, Robert P. Crago, "we couldn't imagine where we could absorb two thousand programmers at IBM when this job would be over some day, which shows how well we were understanding the future at that time." IBM would use its experience designing massive, integrated real-time networks with SAGE to design its SABRE airline reservation system, which met with much success. IBM was the largest of the eight major computer companies (with UNIVAC, Burroughs, NCR, Control Data Corporation, General Electric, RCA, and Honeywell) through most of the 1960s. People in this business would talk jokingly of "IBM and the seven dwarfs," given the much smaller size of the other companies' computer divisions (IBM produced approximately 70 percent of all computers in 1964). In 1970, Gneral Elecrtric sold most of its computer business to Honeywell and in 1971, RCA sold its computing division to Sperry Rand. With only Burroughs, UNIVAC, NCR, Control Data, and Honeywell producing mainframes, people then talked, but by now in humorless, blistering criticism, of "IBM and the BUNCH." In April 1973 Honeywell v. Sperry Rand, a landmark U.S. federal court case, was decided. That decision invalidated the 1964 patent for the ENIAC, the world's first general-purpose electronic digital computer, thus putting the invention of the electronic digital computer into the public domain. A key event at IBM in 1969 was the decision to "unbundle" software from hardware sales. In the 1980s, IBM consolidated its mainframe business, and expanded the scope of mainframes with the S/390 and ESA/390 series. Importantly, during this time, the company embarked on the practice of converting its large rental base of mainframes to lease agreements. This financial strategy created the perception that IBM's revenues and profits were much stronger than they really were, as in the mid to latter part of the decade, management scrambled to react to the spending shift towards distributed computing, which threatened the monopoly IBM held within the technology business. The company hired Don Estridge at the IBM Entry Systems Division in Boca Raton, Florida. With a team known as "Project Chess," they built the IBM PC, launched on August 12 1981. Although not cheap, at a base price of US$1,565 it was affordable for businesses—and many businesses purchased PCs. Typically, these purchases were not by corporate computer departments, as the PC was not seen as a "proper" computer. Purchases were often instigated by middle managers and senior staff who saw the potential—once the revolutionary VisiCalc spreadsheet, the "killer app" on the Apple II personal computer, had been surpassed by a far more powerful and stable product, Lotus 1-2-3. Reassured by the IBM name, they began buying microcomputers on their own budgets aimed at numerous applications that corporate computer departments did not, and in many cases could not, accommodate. Up to this point in its history, IBM relied on a vertically integrated strategy, building most key components of its systems itself, including processors, operating systems, peripherals, databases and the like. In an attempt to speed time to market for the PC, IBM chose not to build the operating system and microprocessor internally, rather it sourced these vital components from Microsoft and Intel, respectively. Ironically, in a decade which marked the end of IBM's monopoly, it was this fateful decision by IBM that passed the sources of its monopolistic power (operating system and processor architecture) to Microsoft and Intel, paving the way for the creation of hundreds of billions of dollars of market value outside of IBM. In the midrange arena, IBM consolidated the market position its General Systems Division had built in the 1970s with the System/3, System/32 and System/34. The System/38, with its radical architecture, had experienced delays to its first customer shipment since announcement in 1978. 1983 saw the announcement of the System/36, the replacement for the System/34. In 1988, IBM announced the AS/400, intended to represent a point of convergence for both System/36 customers and System/38 customers. The 1970s had seen IBM develop a range of Billing, Inventory Control, Accounts Receivable, & Sales Analysis (BICARSA) applications for specific industries: construction (CMAS), distribution (DMAS) and manufacturing (MMAS), all written in the RPG II language. By the end of the 1980s, IBM had almost completely withdrawn from the BICARSA applications marketplace. Because of developments in the antitrust cases against IBM brought by the U.S. government and European Union, IBM sales representatives were now able to work openly with application software houses as partners (For a period in the early 1980s, a "rule of three" operated, which obliged IBM sales representatives, if they were to propose a third-party application to a customer, to also list at least two other third-party vendors in the IBM proposal. This caused some amusement to the customer, who would typically have engaged in intense negotiations with one of the third parties and probably not have heard of the other two vendors.). As the decade ended, it was clear that competition and innovation in the computer industry was now taking place along segmented, versus vertically integrated lines, where leaders emerged in their respective domains. Examples included Intel in microprocessors, Microsoft in desktop software, Novell in networking, HP in printers, Seagate in disk drives, and Oracle in database software. Soon IBM's dominance in personal computers would be challenged by the likes of Compaq and later Dell. Recognizing this trend, CEO John Akers, with the support of the Board of Directors, began to split IBM into increasingly autonomous business units (for example, processors, storage, software, services, printers, and so on) to compete more effectively with competitors that were more focused and nimble and had lower cost structures. IBM's traditional mainframe business underwent major changes in the 1990s, as customers increased their emphasis on departmental and desktop computing. However, the decade of the 1990s began with IBM posting record profits up to that point. This proved illusory as its rental to lease conversion was tapping out, demand for mainframes was waning and corporate downsizing was in full swing. Corporate spending shifted from high profit margin mainframes to lower margin microprocessor-based systems and the growth in IBM's PC business was not nearly enough to offset the company's mainframe revenue decline. On October 5, 1992, at the COMDEX computer expo, IBM announced the first ThinkPad laptop computer, the 700c. The computer, which then cost US$4,350, included a 25 MHz Intel 80486SL processor, a 10.4-inch active matrix display, removable 120 MB hard drive, 4 MB RAM (expandable to 16 MB) and a TrackPoint II pointing device. A decade of steady acceptance and widening corporate growth of local area networking technology, a trend headed by Novell Inc. and other vendors, and its logical counterpart, the ensuing decline of mainframe sales, brought about a wake-up call for IBM: After two consecutive years of reporting losses in excess of $1 billion, on January 19 1993, IBM announced a US$8.10 billion loss for the 1992 financial year, which was then the largest single-year corporate loss in U.S. history. In 2002, IBM strengthened its business advisory capabilities by acquiring the consulting arm of professional services firm PricewaterhouseCoopers. The company has increasingly focused on business solution-driven consulting, services and software, with emphasis also on high-value chips and hardware technologies; as of 2005 it employs about 195,000 technical professionals. That total includes about 350 Distinguished Engineers and 60 IBM Fellows, its most-senior engineers. A chart showing IBM's revenue and net income, 1980–2005. A chart showing IBM's patent history, 1993–2005. In the same year, its hard disk operations were sold to Hitachi. IBM has steadily increased its patent portfolio since the early 1990s, which is valuable for cross-licensing with other companies. In every year from 1993 to 2005, IBM has been granted significantly more U.S. patents than any other company. The 13-year period has resulted in over 31,000 patents for which IBM is the primary assignee. In 2003, IBM earned 3415 patents, breaking the US record for patents in a single year. Protection of the company's intellectual property has grown into a business in its own right, generating over $10 billion dollars for the company during this period. A 2003 Forbes article quotes Paul Horn, head of IBM Research, saying that IBM has generated $1 billion in profit by licensing intellectual property. In 2004, IBM announced the proposed sale of its PC business to Chinese computer maker Lenovo Group, which is partially owned by the Chinese government, for US$650 million in cash and US$600 million in Lenovo stock. The deal was approved in March 2005, and completed in May 2005. IBM acquired a 19% stake in Lenovo, which moved its headquarters to New York state and appointed an IBM executive as its chief executive officer. The company retained the right to use certain IBM brand names for an initial period of five years. As a result of the purchase, Lenovo inherited a product line that features the ThinkPad, a line of laptops that had been one of IBM's most successful products. As of 2004, IBM had shifted much of its focus to the provision of business consulting and re-engineering services from its hardware and technology focus. The new IBM has enhanced global delivery capabilities in consulting, software and technology-based process services. In May 2007, IBM unveiled Project Big Green—a re-direction of $1 billion per year across its businesses to increase energy efficiency. New IBM products and services are expected to reduce data center energy consumption and transform clients' technology infrastructure into "green" data centers, with energy savings of approximately 42 percent for an average data center. Project Big Green outlines a five-step approach for clients to dramatically improve energy efficiency. The initiative includes a new global "green team" of more than 850 energy efficiency architects from across IBM. As part of Project Big Green, IBM is building an $86 million green data center expansion at its Boulder, Colorado location and will consolidate nearly 4,000 computer servers in six locations worldwide onto about 30 refrigerator-sized mainframes running the Linux operating system. Eclipse is a platform-independent, Java-based software framework. Eclipse was originally a proprietary product developed by IBM as a successor of the VisualAge family of tools. Eclipse has subsequently been released as free/open source software under the Eclipse Public License. It is the foundation of Lotus Symphony, a Microsoft Office-compatible productivity suite based on the open-source OpenOffice.org project. Flexible Internet Evaluation Report Architecture—A highly flexible architecture for the design, display, and reporting of Internet surveys. IBM History Flow Visualization Application—A tool for visualizing dynamic, evolving documents and the interactions of multiple collaborating authors. IBM Linux on POWER Performance Simulator—A tool that provides users of Linux on Power a set of performance models for IBM's POWER processors. Database File Archive And Restoration Management—An application for archiving and restoring hard disk files using file references stored in a database. Policy Management for Autonomic Computing—A policy-based autonomic management infrastructure that simplifies the automation of IT and business processes. FairUCE—A spam filter that verifies sender identity instead of filtering content. Unstructured Information Management Architecture (UIMA) SDK—A Java SDK (software developers kit) that supports the implementation, composition and deployment of applications working with unstructured information. Accessibility Browser—A web-browser specifically designed to assist the visually-impaired, to be released as open-source software. Also known as the "A-Browser," the technology will aim to eliminate the need for a mouse, relying instead completely on voice-controls, buttons and predefined shortcut keys. Extreme Blue is a company initiative that uses experienced IBM engineers, talented interns and business managers to develop high-value technology. The project is designed to analyze emerging business needs and the technologies that can solve them. These projects mostly involve rapid-prototyping of high-profile software and hardware projects. Entry into ExtremeBlue is competitive for both interns and IBM employees. Virtually all modern console gaming systems use microprocessors developed by IBM. Microsoft's Xbox 360 contains the Xenon tri-core processor, which was designed and produced by IBM in less than 24 months. Sony's PlayStation 3 features the Cell BE microprocessor designed jointly by IBM, Toshiba, and Sony. Nintendo's seventh-generation console, Wii, features an IBM chip codenamed Broadway. The older Nintendo GameCube also utilized the Gekko processor, designed by IBM. In May 2002, IBM and Butterfly.net announced the Butterfly Grid, a commercial grid for the online video gaming market. In March 2006, IBM announced separate agreements with Hoplon Infotainment, Online Game Services Incorporated (OGSI), and RenderRocket to provide on-demand content management and blade server computing resources. IBM announced it will launch its new software, called "Open Client Offering," which is to run on Microsoft's Windows, Linux, and Apple's Mac OS X. The company states that its new product allows businesses to offer employees a choice of using the same software on Windows or its alternatives. This means that "Open Client Offering" is to cut costs of managing whether Linux or Mac OS X relative to Windows. There will be no necessity for companies to pay Microsoft for its licenses for operations since the operations will no longer rely on software which is Windows-based. The main alternative to Microsoft Office's file formats is the Open Document Format, the development of which IBM supports. IBM plans to install Open Client on five percent of its desktop PCs. UC2 (Unified Communications and Collaboration) is an IBM and Cisco joint project based on Eclipse and OSGi. It will offer Eclipse application developers a unified platform for an easier work environment. Software based on the UC2 platform will provide major enterprises with easy-to-use communication solutions, such as the Lotus-based Sametime. In the future the Sametime users will benefit from such additional functions as click-to-call and voice mailing. Information Management Software—database servers and tools, text analytics, and content management. Lotus Software—Groupware, collaboration and business software. Acquired in 1995. Rational Software—Software development and application lifecycle management. Acquired in 2002. Tivoli Software—Systems management. Acquired in 1996. WebSphere—An EJB development environment, container, and a series of pre-packaged applications, primarily for management interfaces and web commerce. Big Blue is a nickname for IBM; several theories exist regarding its origin. One theory, substantiated by people who worked for IBM at the time, is that IBM field representatives coined the term in the 1960s, referring to the color of the mainframes IBM installed in the 1960s and early 1970s. "All blue" was a term used to describe a loyal IBM customer, and business writers later picked up the term. Another theory suggests that Big Blue simply refers to the Company's logo. A third theory suggests that Big Blue refers to a former company dress code that required many IBM employees to wear only white shirts and many wore blue suits. IBM has often been described as having a sales-centric or a sales-oriented business culture. Traditionally, many IBM executives and general managers are chosen from the sales force. The current CEO, Sam Palmisano, for example, joined the company as a salesman and, unusually for CEOs of major corporations, has no MBA or postgraduate qualification. Middle and top management are often enlisted to give direct support to salesmen when pitching sales to important customers. A dark (or gray) suit, white shirt, and a "sincere" tie was the public uniform for IBM employees for most of the 20th century. During IBM's management transformation in the 1990s, CEO Lou Gerstner relaxed these codes, normalizing the dress and behavior of IBM employees to resemble their counterparts in other large technology companies. In 2003, IBM embarked on an ambitious project to rewrite company values. Using its Jam technology, the company hosted Intranet-based online discussions on key business issues with 50,000 employees over three days. The discussions were analyzed by sophisticated text analysis software (eClassifier) to mine online comments for themes. As a result of the 2003 Jam, the company values were updated to reflect three modern business, marketplace and employee views: "Dedication to every client's success," "Innovation that matters—for our company and for the world," "Trust and personal responsibility in all relationships." In 2004, another Jam was conducted during which 52,000 employees exchanged best practices for 72 hours. They focused on finding actionable ideas to support implementation of the values previously identified. A new post-Jam Ratings event was developed to allow IBMers to select key ideas that support the values. The board of directors cited this Jam when awarding Palmisano a pay rise in spring 2005. In July and September 2006, Palmisano launched another jam called InnovationJam. InnovationJam was the largest online brainstorming session ever with more than 150,000 participants from 104 countries. The participants were IBM employees, members of IBM employees' families, universities, partners, and customers. InnovationJam was divided in two sessions (one in July and one in September) for 72 hours each and generated more than 46,000 ideas. In November 2006, IBM declared that they will invest US$100 million in the 10 best ideas from InnovationJam. IBM has been influenced by the Open Source Initiative, and began supporting Linux in 1998. The company invests billions of dollars in services and software based on Linux through the IBM Linux Technology Center, which includes over 300 Linux kernel developers. IBM has also released code under different open-source licenses, such as the platform-independent software framework Eclipse (worth approximately US$40 million at the time of the donation) and the Java-based relational database management system (RDBMS) Apache Derby. IBM's open source involvement has not been trouble-free, however. The IBM Project Management Center of Excellence (PM COE) is a program dedicated to defining and executing the steps IBM must take to strengthen its project management capabilities. Functioning as IBM's think tank, the PM COE combines external industry trends and directions with IBM business, organizational, and geographic requirements and insight. Upon this foundation, deliverables (such as project management policy, practices, methods, and tools) are developed. All IBM Project Managers (PMs) on the Project Management track must complete either accreditation or IBM certification. Junior PMs (Associate PM and Advisory PM) are accredited after self-assessment and authorization from supervisors. Senior PMs (Senior PM and Executive PM) must go through a stringent IBM certification process. By validating project managers' expertise and skills against consistent worldwide standards, certification helps maintain customer confidence in the high quality of IBM professionals and it recognizes IBM professionals for their skills and experience. Successfully passed PMI exam (i.e., be a certified PMP). Verifiable documentation and approval for mastery/expertise in a well-defined set of PM skills. Several years of PM experience spanning at least three verifiable projects within the immediate five years (including specific role, team size, and budget requirements). Verifiable documentation and proof of at least one area of specialty. Demonstrated the use of IBM's Worldwide Project Management Method (WWPMM). Completed extensive classroom and online education and testing. Candidate preparing a detailed package with proof of above requirements. Package review, approval, and support by at least two levels of Senior Management. Package review and re-verification by PM COE expert. Personal interviews with the PM COE Certification board. Candidates whose experience, skills, knowledge and education are deemed valid, verifiable and accurate, are certified by the board as either Certified Senior Project Manager (CSPM) or Certified Executive Project Manager (CEPM). IBM PM Certification is a significant achievement for any IBMer. It is a deliberately long process with multiple checkpoints designed to ensure the integrity, fairness and validity of the certification. Historically IBM has had a good reputation of long-term staff retention with few large-scale layoffs. In more recent years there have been a number of broad sweeping cuts to the workforce as IBM attempts to adapt to changing market conditions and a declining profit base. After posting weaker than expected revenues in the first quarter of 2005, IBM eliminated 14,500 positions from its workforce, predominantly in Europe. In May 2005, IBM Ireland said to staff that the MD (Micro-electronics Division) facility was closing down by the end of 2005 and offered a settlement to staff. The production moved to a company called Amkor in Singapore, who purchased IBM's Microelectronics business in Singapore and it is widely agreed that IBM promised this company a full load capacity in return for the purchase of the facility. On June 8, 2005, IBM Canada eliminated approximately 700 positions. IBM projects these as part of a strategy to "rebalance" its portfolio of professional skills and businesses. IBM India and other IBM offices in China, the Philippines and Costa Rica have been witnessing a recruitment boom and steady growth in number of employees. On October 10, 2005, IBM became the first major company in the world to formally commit to not using genetic information in its employment decisions. This came just a few months after IBM announced its support of the National Geographic Society's Genographic Project. The logo that was used from 1947 to 1956. The familiar "globe" was replaced with the simple letters "IBM" in a typeface called "Beton Bold. The logo that was used from 1956 to 1972. The letters "IBM" took on a more solid, grounded and balanced appearance. In 1972, the horizontal stripes now replaced the solid letters to suggest "speed and dynamism." This logo (in two versions, 8-bar and 13-bar), as well as the previous one, was designed by graphic designer Paul Rand. Logos designed in the 1970s tended to be sensitive to the technical limitations of photocopiers, which were then being widely deployed. A logo with large solid areas tended to be poorly copied by copiers in the 1970s, so companies preferred logos that avoided large solid areas. The 1972 IBM logos are an example of this tendency. With the advent of digital copiers in the mid-1980s this technical restriction had largely disappeared; at roughly the same time, the 13-bar logo was abandoned for almost the opposite reason—it was difficult to render accurately on the lower resolution printers of the time. Edwin Black alleged that during World War II, IBM CEO Thomas J. Watson used overseas subsidiaries to provide the Third Reich with punch card machines that could help the Nazis track down European Jewry. IBM denies that they had control over these subsidiaries after the Nazis took control of them. A lawsuit against IBM based on these allegations was dismissed. ↑ IBM, Nanotechnology & Nanoscience. Retrieved December 18, 2007. ↑ IBM, IBM maintains patent lead, moves to increase patent quality. Retrieved December 18, 2007. ↑ IBN Research, Worldwide IBM Research Locations. Retrieved December 18, 2007. ↑ IBM Research, Awards & Achievements. Retrieved December 18, 2007. ↑ Office Museum, Early Hollerith history, with good photographs of period equipment. Retrieved January 7, 2009. ↑ Martin Campbell-Kelly and William Aspray, Computer a History of the Information Machine—Second Edition (Westview Press, 2004). ↑ IBM, http://www-03.ibm.com/ibm/history/documents/pdf/faq.pdf IBM Archives: Frequently Asked Questions.] Retrieved January 7, 2009. ↑ IBM, IBM Archives: Charles R. Flint. Retrieved January 7, 2009. ↑ IBM, IBM Archives: 1930s. Retrieved January 7, 2009. ↑ IBM, IBM-Archive-1928. Retrieved January 7, 2009. ↑ IBM, IBM Archives: 1940s. Retrieved January 7, 2009. ↑ Robert Wendover, High Performance Hiring (Thomas Crisp Learning, 2003, ISBN 1-56052-666-1), 179. ↑ 13.0 13.1 Emerson W. Pugh, Building IBM (MIT Press, 1995, ISBN 0-262-16147-8). ↑ E.W. Pugh, L.R. Johnson, and John H. Palmer, IBM's 360 and Early 370 Systems (London: MIT Press, ISBN 0-262-16123-0). ↑ CNET News, IBM's ThinkPad turns 10. Retrieved January 7, 2009. ↑ IBM, IBM Archives—1993. Retrieved January 7, 2009. ↑ CNET, IBM talks up "computing on demand." Retrieved January 7, 2009. ↑ Martin Lamonica, IBM fills in on-demand picture. Retrieved January 7, 2009. ↑ IDG News Servce, Hitachi absorbs IBM hard-disk unit, announces new drives. Retrieved January 7, 2009. ↑ IBM, IBM maintains patent lead, moves to increase patent quality. Retrieved January 7, 2009. ↑ IBM, IBM breaks U.S. patent record. Retrieved January 7, 2009. ↑ John Teresko, IBM's Patent/Licensing Connection. Retrieved January 7, 2009. ↑ Forbes, IBM's Path From Invention To Income. Retrieved January 7, 2009. ↑ pWharton School of the University of Pennsylvania, Can Big Blue Succeed In BPO? Retrieved January 7, 2009. ↑ IBM, IBM delivers Power-based chip for Microsoft Xbox 360 worldwide launch. Retrieved December 18, 2007. ↑ IBM, Butterfly and IBM introduce first video game industry computing grid. Retrieved December 18, 2007. ↑ IBM, IBM joins forces with game companies around the world to accelerate innovation. Retrieved December 18, 2007. ↑ InfoNIAC, IBM and Cisco: Attempt to Unite the Communication Software Developers. Retrieved December 18, 2007. ↑ Rotovision, Logos, Letterheads & Business Cards: Design for Profit. Retrieved December 18, 2007. ↑ Google Books, The Essential Guide to Computing: The Story of Information Technology. Retrieved December 18, 2007. ↑ Koran Page, Strategic Marketing. Retrieved December 18, 2007. ↑ IBM, Speeches. Retrieved December 18, 2007. ↑ IBM, InnovationJam. Retrieved April 24, 2008. ↑ InfoWorld, IBM to invest $100M in new business areas. Retrieved December 18, 2007. ↑ IBM, IBM launches biggest Linux lineup ever. Retrieved December 18, 2007. ↑ Eklektix, Inc., invests in Brazil Linux Tech Center. Retrieved December 18, 2007. ↑ WorkingWoman, 100 best companies for working mothers 2004. Retrieved December 18, 2007. ↑ WorkinghWoman, 100 best companies 2005. Retrieved December 18, 2007. ↑ Blogspot, IBM settles overtime lawsuit for $65 million. Retrieved December 18, 2007. ↑ IBM, IBM Archives: IBM continuity (1956-1972). Retrieved December 18, 2007. ↑ IBM, "IBM Archives: IBM international. Retrieved December 18, 2007. ↑ IBM, Addendum to IBM Statement on Nazi-era Book and Lawsuit Retrieved December 18, 2007. Bauer, Roy A., et al. 1992. The Silverlake Project: Transformation at IBM (AS/400). New York: Oxford University Press. ISBN 9780195067545. Black, Edwin. 2001. IBM and the Holocaust the Strategic Alliance Between Nazi Germany and America's Most Powerful Corporation. New York: Crown Publishers. ISBN 9780609607992. Carroll, Paul. 1993. Big Blues: The Unmaking of IBM. New York: Crown Publishers. ISBN 9780517591970. DeLamarter, Richard Thomas. 1986. Big Blue: IBM's Use and Abuse of Power. New York: Macmillan. ISBN 9780396085157. Emerson W. Pugh, Emerson W. 1996. Building IBM: Shaping an Industry. Cambridge: Massachusetts Institute of Technology. ISBN 9780262161473. Gerstner, Louis V. 2002. Who Says Elephants Can't Dance? Inside IBM's Historic Turnaround. New York, NY: HarperBusiness. ISBN 9780060523794. Heller, Robert. 1994. The Fate of IBM. London: Little & Brown, ISBN 9780316907422. Mercer, David. 1987. IBM: How the World's Most Successful Corporation is Managed. London: K. Page. ISBN 9781850912873. Rodgers, F. G., and Robert L. Shook. 1986. The IBM way Insights into the World's Most Successful Marketing Organization. New York: Harper & Row. ISBN 9780060155223. Slater, Robert. 1999. Saving Big Blue: IBM's Lou Gerstner New York: McGraw Hill. ISBN 9780585189505. Slater, Robert. 1999. Saving Big Blue Leadership Lessons and Turnaround Tactics of IBM's Lou Gerstner. New York, NY: McGraw Hill. ISBN 9780585189505. Watson, Thomas J. Jr. 1990. Father, Son & Co: My Life at IBM and Beyond. New York: Bantam. ISBN 9780553070118. History of "International Business Machines"
This page was last modified on 4 March 2018, at 17:06.